Lock in a great price for Monte-Carlo Bay Hotel & Resort – rated 8.9 by recent guests! Great hotel and location. Very friendly staff. Great view from hotel room. the hotel was amazing, as you would expect from an expensive, top notch hotel. It didn't exceed my expectations because we paid top dollars for our stay. The breakfast was very good (not worth 36 Euros but still), the gym is brand new and fully loaded, the pools and hot tub were amazing. Extremely clean and very good staff. The bed was huge and the view was extraordinary. The Hotel was in one of the most exclusive and beautiful places in the south of France. The views were breathtaking and the Hotel was immaculate. One if the best values at booking.com ever !! The rooms are very spacious. The bathroom is well designed and unlike a lot of modern hotels has a proper door, so if one person gets up during the night, it doesn't have to wake the other person up. Breakfast room service was served at exactly the time ordered which was important when at the hotel on business. breakfast is very good and the location is perfect. when we arrived we asked to change the room 2 times and they were willing to do the change without any problem. I loved the relaxed atmosphere and the heated outdoor pool area. I love the balcony with the sea views and the fact that the room service is so quick and easy . Monte-Carlo Bay Hotel & Resort This rating is a reflection of how the property compares to the industry standard when it comes to price, facilities and services available. It's based on a self-evaluation by the property. Use this rating to help choose your stay! Located on the Larvotto peninsula just 400 feet from the French border, Monte-Carlo Bay Hotel & Resort features 4 restaurants is surrounded by 4 hectares of gardens on the sea front. It offers a casino, a 2953 ft² spa and a lagoon with waterfalls and hot tubs. Each air-conditioned and individually decorated room at Monte-Carlo Bay Hotel & Resort has a flat-screen TV with video games and a balcony or terrace with views of the surrounding area. Guests can choose between a buffet, continental or American breakfast. Marcel Ravin is the chef at the hotel restaurants, 2 of which are located in the gardens. After a workout at the gym, guests can play billiards or relax by the pool. Guests can also have a treatment at the spa or order a love seat for 2 on the sun terrace, both at an additional cost. There is a kids' club available during the summer months. The hotel with private helipad is located 30 minutes from Nice Airport by car and 7 minutes by helicopter. It is an 8-minute car ride from Monaco-Monte Carlo Train Station and has a jetty for access by boat. When would you like to stay at Monte-Carlo Bay Hotel & Resort? An extra bed can be accommodated in this room for a EUR 115 extra fee per day. Decorated in a contemporary style, this twin room features air conditioning, a desk and a 30 ft² terrace. It also offers sea and garden views. It is equipped with two140 cm double beds. This double room has a soundproofing, seating area and DVD player. 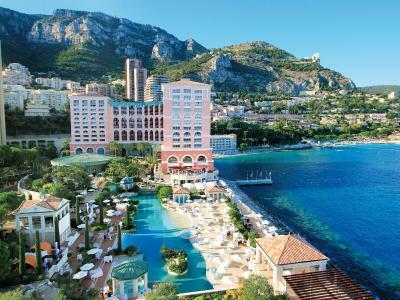 The Monte Carlo Bay Hotel & Resort is a spectacular resort with 334 rooms and suites, set on a garden peninsula. Cultivating a chic but casual ambiance, with 3 restaurants, 3 bars, a Cinq Mondes SPA and a Casino, it offers a new approach to a legendary destination, blending lightness, enjoyment and an aura of festivity. House Rules Monte-Carlo Bay Hotel & Resort takes special requests – add in the next step! Monte-Carlo Bay Hotel &amp; Resort accepts these cards and reserves the right to temporarily hold an amount prior to arrival. Monte-Carlo Bay Hotel & Resort accepts these cards and reserves the right to temporarily hold an amount prior to arrival. Guests are reminded that Le Blue Bay restaurant and the Blue Gin bar require a smart casual dress code. Please note that the kids' club is only open during July and August. Please note that for all reservations exceeding a total value of EUR 20,000, a nonrefundable prepayment of 10% will be taken at the time of reservation. Upon arrival at the bar in the afternoon the Staff was not on top of things. Orange juice or any kind of fruit juice was already not available and the shower did not work properly. And in a hotel like this class that cannot happen. But besides this everything was perfect. i didn't like the air refresher placed in each floors, it imposes the=is chemical smell and it gave me allergy. i didn't like that the swimming pool is not heated enough, almost cold. The service ambience and food! Just that you have to pay to use the sauna and hamman I was expecting this to be free considering you pay a considerate amount for the food and room. I think the corridor can have a little more decorations. The swimming pool is my favorite and is fabulous. The bed is really comfortable and the shower is comfy as well. We are particularly impressed by the seats in the lift, making me really happy with the hotel/resort. Only thing we didn't like was the €150 per night pre-authorisation required in case there was any breakages or damage, which was taken from credit card. Have never had anything like this before. From such an expensive and exclusive hotel and resort.